Poisons are a type of hazardous waste that can contaminate drinking water sources and threaten human health. Keep poisons out of the trash, and never pour down the drain. 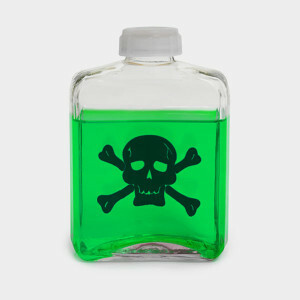 Dispose of a poison if there is damage to the container, such as if it is punctured or the label is illegible. Pack any damaged poison bottles into another empty container to prevent it from leaking. The EPA recommends that every household do a room-to-room safety inspection, especially if there are kids present. Check out the the EPA’s handy checklist and action steps for poison-proofing your house. It’s best practice to only buy as much as you need. Not leaving partially filled bottles of poison around the house limits your exposure to this hazardous substance, which can be damaging to your health overtime.